Spring and early summer is busy time period for people involved in agricultural field services. 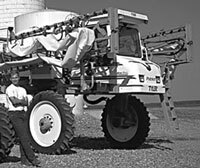 This includes employees who work in fertilizer plants and those who do custom application (herbicides, fertilizer, etc). Several studies point to a direct connection between "hours worked" in a week and the potential for INJURY. The publication Stress, Fatigue, and the Custom Applicator deals with many of these issues in a positive way and provides SPECIFIC, positive suggestions for both workers and managers to better manage stress and reduce the risks during these critically busy and potentially dangerous times of the year.